Often there is a discussion about likable main characters. The audience wants to LIKE your main character, generally the conversation goes. We want to watch a character we like struggle towards his or her goal. But, I don’t think that’s true. I don’t think we have to LIKE the main character. We want to relate to him/her (understand what they want–love, money, etc.) but I don’t think we need to LIKE the main character. But then why do we keep watching? Because the story is compelling. We want, we must see how it turns out. 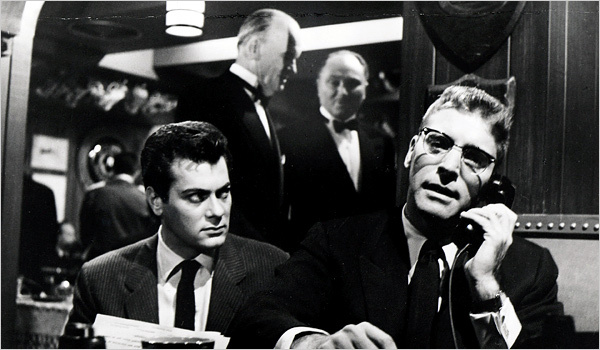 Recently, I was lucky to see Sweet Smell of Success, a 1957 film starring Tony Cutis and Burt Lancaster, with a script by Clifford Odets. It’s the story of a press agent (Curtis) doing the dirty work of a powerful columnist (Lancaster). Lancaster’s sister is dating someone he doesn’t approve of, one of Curtis’s clients. Lancaster wants the relationship ended and Curtis to do it. We watch as Curtis hustles his way through clubs, reporters, friends, in an effort to end the relationship and come out unscathed, in his quest to become rich and famous. He sees Lancaster as his way up. Lancaster sees him as a bug. It’s an amazing performance by both men. Curtis, the protagonist, is unlikable. He’s charming, to be sure, and that probably makes him watchable. But, he’s more than willing to prostitute a friend in order to get an article into a paper from another columnist. 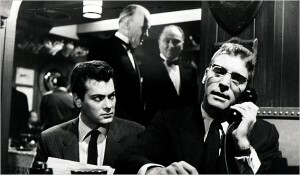 He’s willing to get his OWN CLIENT in trouble (labeled a Marxist), in order to continue a relationship with Lancaster. And he makes no bones about it: he wants to get rich. And I think that might be the key of why we keep watching. That relatable nugget. Who doesn’t want to get rich? But what are we willing to do to get there? And that’s what’s happening in this movie. Each step Curtis takes, takes him down a deeper and deeper road as the ethical/moral line keeps getting crossed. First, he leaps, gladly, and then… more and more reluctantly. It becomes a compelling story. Is there something he won’t do? What’s to far for this character? When is he going to say no…? How far is to far? The tension builds until the end, on Curtis and us. Characters don’t have to be likable. Relatable, yes. Motivations, clear. They CAN’T be HATEABLE. We can’t HATE them. If we hate them, then we will never relate to them. We don’t relate to things we hate. But, in the end, the character doesn’t have to be likable. As long as the story is compelling and they can relate to the main character, an audience will be engaged.